Despite a report from Entertainment Tonight on Wednesday that claimed STONE TEMPLE PILOTS have selected one-time "The X Factor" contestant Jeff Gutt as their new vocalist, a band representative says no final decision has been made. 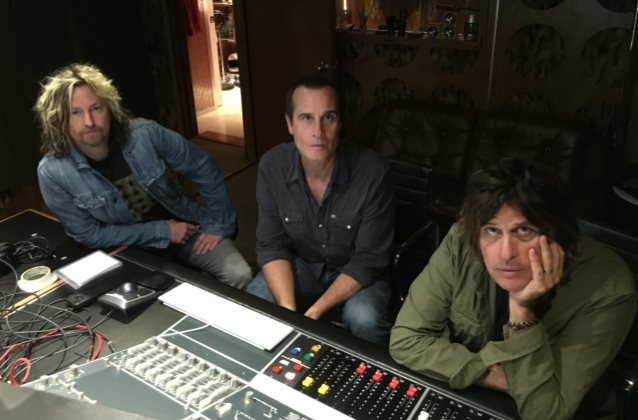 "The band has been rehearsing with several singers over the past few weeks," the STONE TEMPLE PILOTS rep tells Entertainment Weekly in a statement. "They haven't made a decision yet." Entertainment Tonight reported that Gutt, who was a runner-up in season three and now goes by his full name of Jeffrey Adam Gutt, has been writing and recording new material in Redondo Beach, California with bandmembers Dean DeLeo, Robert DeLeo and Eric Kretz for the past few months. A source told the site that Gutt and the bandmembers have officially begun rehearsals in Hollywood this week, and are expected to tour next year. Gutt appeared on "The X Factor" in 2013, where he was mentored by Kelly Rowland and impressed the other judges with his covers of songs like "Creep", "Dream On" and "Hallelujah". Dean DeLeo told The Pulse Of Radio not long ago that the band would know quickly when it found the right singer. "You know that feeling you get when someone opens their mouth to sing, you know," he said. "They could sing three words and you know. You're either in or you're out, and I think we'll know that." For several months, it's been rumored that STP had recruited Filipino musician John Borja to follow in the footsteps of the late Scott Weiland and LINKIN PARK's Chester Bennington as their third lead vocalist. Borja himself had hinted on Facebook that he had spent time in Los Angeles with the members of STP, although he stopped short of saying he had the job. STP began looking for a new frontman with open auditions last February. The band started its quest following the death last year of Weiland, who had been estranged from the group since 2013, and the end of a short-lived collaboration with Bennington.